Indian army soldiers have marched through Srinagar, the capital of Indian-administered Kashmir, in a show of force to help quell street protests. A curfew is being strictly enforced in parts of the Kashmir Valley after a wave of violence between protesters and police over the past month. 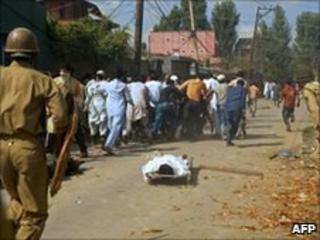 Police and paramilitaries have been deployed in Srinagar and several towns are under curfew. Some 14 civilians have died in clashes with security forces since June. Correspondents say the Indian government is concerned over the situation, especially as the country's foreign minister is due to hold talks with Pakistan next week. Kashmir is an issue that has long affected relations between the two countries which both claim the territory in its entirety - the Indian government has already accused Pakistan-based militant groups of instigating the latest protests. Hundreds of thousands of troops are based in Kashmir to fight a two-decade insurgency against Indian rule. The state government sought the army's help on Tuesday evening after three civilians were killed in police firing, the BBC's Altaf Hussain in Srinagar reports. The federal government has yet to decide whether to deploy the army in Kashmir. Indian Home Secretary GK Pillai is travelling to Srinagar to decide whether more troops should be deployed. "We are out to give support to the state machinery. We are ready to move anywhere, anytime," the Associated Press news agency quoted army spokesman Col Vineet Sood as saying. A defence spokesman, Lt Col JS Brar, told the BBC that the army had conducted "a flag march" on the outskirts of Srinagar city, particularly on the road leading to the airport. Lt Col Brar said the army had not been deployed anywhere in the city. A curfew has been imposed in Srinagar and is being strictly enforced by the police and paramilitaries who are deployed in strength, our correspondent says. The curfew in Anantnag has now been in place for eight consecutive days - since three people were killed by police there last week - and there is no sign of the tension diminishing, he says. Most of the Muslim-majority Kashmir valley has either been under a curfew or shut down for weeks because of protests over the killing of civilians by police and paramilitary forces. Many of the recent deaths have been blamed on the paramilitary Central Reserve Police Force (CRPF). Chief Minister Omar Abdullah has defended the security forces, saying they cannot be expected to show restraint all the time when they are being pelted with stones.